The end of an era (via Facebook). 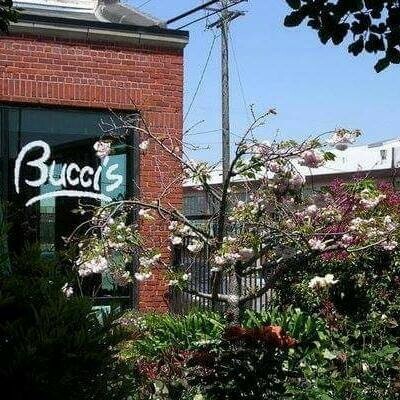 1) Sad news for fans of Emeryville’s homey, East Coast-style Italian restaurant Bucci’s (6121 Hollis St.), which the Mercury News reports will close at the end of September. The owners, including the restaurant’s namesake Amelia Bucci, have decided to retire after nearly thirty years of business. “After nearly three fulfilling and memorable decades of pizza, pasta, friends, and more, we have decided to end this chapter of our career here, and allow ourselves to pursue other endeavors,” the co-owners wrote in a Facebook post. The restaurant is now for sale; the current listing price is $225,000. 2) Elsewhere in Emeryville, the E-ville Eye reports that a new California cuisine spot called Propaganda is coming to 4000 Adeline Street. Owner Kiet Truong, who also runs Unicorn, an Asian fusion restaurant in San Francisco, said he plans to serve comfort food and high-end bar bites. 3) A few weeks ago, we told you about the soft opening of Salsipuedes (4201 Market St., Oakland), a “seaside barbecue” shack of sorts that specializes in New Baja cuisine. It’s worth noting that the restaurant had its official grand opening last week. Eater has some photos of what looks to be a very chill, casual space — for now, the restaurant isn’t taking reservations except in the case of large parties. Restaurant at Meadowood alum Marcus Krauss’s menu (only slightly updated from the one I posted previously) features lots of surf ’n’ turf dishes, with an emphasis on flavors from that Baja region and the Pacific Rim. 4) Of course, Salsipuedes is but the latest in what has now been several years’ worth of high-profile restaurants to open in Oakland — a fact that perhaps helps account for The Town’s recent selection as a top ten “best local food scene,” according to a USA Today-sponsored poll. It’s best to take such rankings with a grain of salt, but if Oakland residents want to take the opportunity to thumb their nose at the city’s across-the-bridge neighbor — which, as luck would have it, didn’t make the cut — who are we to tell you to hold back? 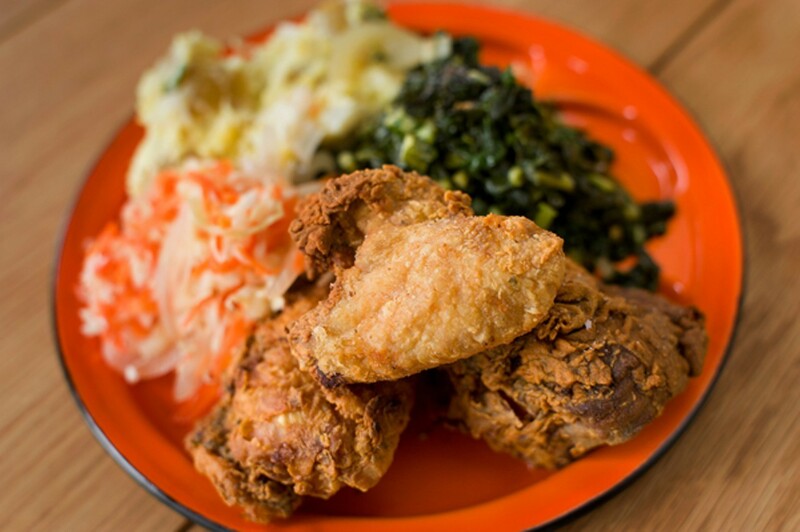 The fried chicken at Miss Ollie's. 5) For the past twelve years, the month of August has been designated as National Black Business Month, and while I haven’t heard much buzz about it this year, August 30 (this Sunday) has traditionally been touted as Black Restaurant Day — a day when the dining public is encouraged to support Black-owned restaurants. Here in Oakland, Miss Ollie’s (901 Washington St.) is normally closed on Sundays, but chef-owner Sarah Kirnon promises to offer some special dishes and cocktails on Saturday, April 29. Taste, Fall 2014: Kingston 11 from East Bay Express on Vimeo. 6) As great as the Bay Area’s dining scene is, I’m sure there are at least a few UC Berkeley alumni who have joked that they majored in food. Now, current Cal undergrads can — or minor in it, anyway. Bay Area Bites reports that starting this fall UC Berkeley is offering a minor in food systems — an interdisciplinary program of study that might include classes in ecology, sociology, nutrition, and economics. 7) Edible East Bay has a nice story about the small farms at Sunol Ag Park and how these farmers are building a much more intimate collaboration with Bay Area chefs — including Preeti Mistry of Oakland’s Juhu Beach Club — than what you’ll typically find with larger farms or at your run-of-the-mill farm-to-table restaurant. 8) A couple of meaty events coming up this weekend: On Saturday, August 29, the butchery-restaurant Clove and Hoof and pop-up Smoke & Smolder are collaborating on a head-to-tail Pig Feast, wherein the chefs will cook and serve a whole pig. $65 will buy you five courses, including such delicacies as fried pig tails (served with buffalo sauce, blue cheese, and celery!) and horseradish ice cream sandwiches made with a pork lard crust. And starting at noon on Sunday, August 30, Smokey J’s (3015 Shattuck Ave., Berkeley) will host a Texas-style pig roast — two pigs slow-smoked for twenty hours, then pulled and served on sandwiches or as part of a plate. Beer will be half off all day. 9) Finally, in case you missed it, I wrote about my misadventures in trying to track down what turned out to be a fake restaurant in the El Cerrito hills.